Just after the death of her newly-born sister, Chanda, 12 years old, learns of a rumor that spreads like wildfire through her small, dust-ridden village near Johannesburg. It destroys her family and forces her mother to flee. Sensing that the gossip stems from prejudice and superstition, Chanda leaves home and school in search of her mother and the truth. 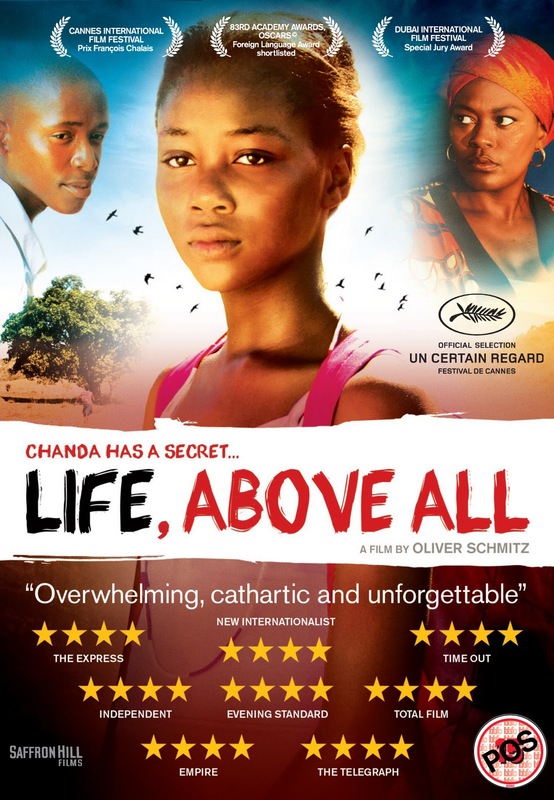 Life, Above All is a film directed by Oliver Schmitz, based on the novel Chandra's Secrets by Allan Stratton. It premiered in the Un Certain Regard section of the 2010 Cannes Film Festival. It was also selected as South Africa's official submission to the 83rd Academy Awards for Best Foreign Language Film, ultimately making the nine film shortlist. It is an emotional story that follows young Chanda (Khomotso Manyaka), who as the film opens, is tasked with arranging her little sister Sarah's funeral, as her grieving mother is ill, and her stepfather is a deadbeat alcoholic. Cursed with an unstable extended family, and a meddling neighbor concerned only with her local reputation, Chanda's only friend is Esther (Keaobaka Makanyane), a troubled classmate who is shunned for wearing overly revealing clothing for her age. Although it is never mentioned outright, we can see from the villagers superstitious reactions and hushed faces, that Sarah did not really die of influenza as the family claims, but of AIDS. It's also evident that her mother Lilian (Lerato Mvelase) is also suffering from it. So the film shows us the terrible cost of a poverty stricken society with inadequate medical facilities, and the brutal effect of town gossip on Chanda, as she tries bravely to go on with her life. Despite the sad and bleak tone of the story, the film does have some solid widescreen cinematography that beautifully captures the sights of rural South Africa. The acting is also impressive, Khomotso Manyaka gives a great perfomance as Chanda, a young girl forced to grow up too soon in an unforgiving environment, and the bond of friendship shared between her and Keaobaka Makanyane's character Esther is wonderfully depicted. Not all is grand though, the story does suffer from some moments of typical sentimental melodrama that hits us with an overall message that can only be described as heavy handed. The failures of the society's support system, from the government to the doctors and teachers are repeatedly paraded on screen, and gets to be a bit much. Overall, this is a decent story of courage and determination, with strong performances and cinematography, but comes across a bit too much like a soap, and is not particularly original enough to leave a lasting impression. It actually seems like an alright watch, but I don't wanna go out of my way to view it. The trailer seems promising enough, interesting... but the cover starts me off with feelings of over compensation. Added witth the heavy hand with which it's all placed and eh. I'll give it a watch if I get the chance, I just won't look for it. Haha yeah, when you place that many gold stars on your poster, you are definitely trying too hard. This one was actually from last year's awards. It was the last of the nine film shortlist that I had not seen yet. hearing back from you! Have a great day!